Attention TWSIs provide critical safety information to everyone at potentially dangerous locations, and particularly to people impacted by blindness. They should only be used to identify potential hazards. A drawing of attention TWSIs showing dimensions (described in text). It’s important to provide consistent safety information so that people impacted by blindness will recognize potentially dangerous situations in any town or province. Attention TWSIs should consist of circular, flat-topped, truncated domes or cones installed on a walking surface. Flat-topped truncated domes or cones should be used, arranged in a square grid pattern, parallel or diagonal at 45 degrees to the main direction of travel. The height of the flat-topped domes or cones should be four to five millimetres. In interior environments with exceptionally smooth surfaces, such as polished concrete or terrazzo, the minimum height of four millimetres is preferred. The diameter of the top of the flat-topped domes or cones should be between 12 and 25 mm. The diameter of the lower base of the flat-topped domes or cones should be 10 mm (+/- 1 mm) more than the diameter of the top. A table showing the spacing between domes/cones, based on their top diameter. 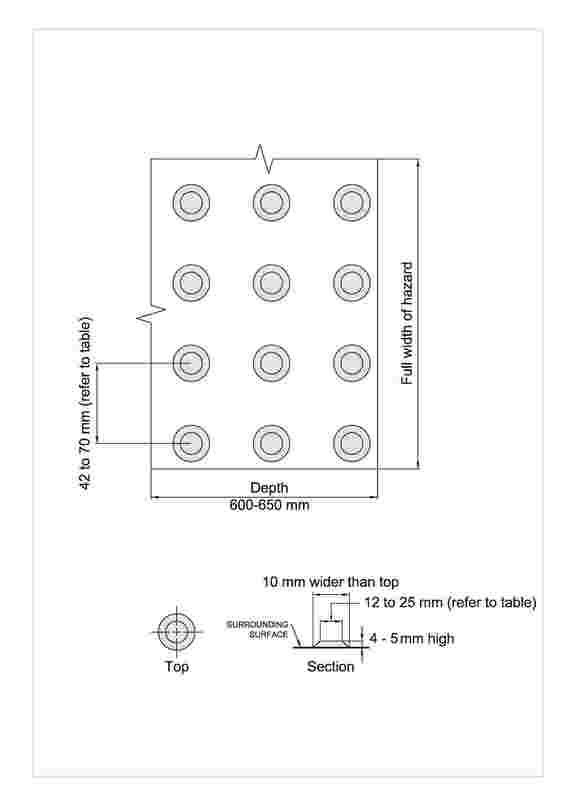 A top diameter of 12 mm is the optimal size of domes or cones for people impacted by blindness to detect and distinguish through the soles of their footwear. Attention TWSIs used on curb ramps at an intersection. The TWSIs are bright yellow, in contrast to the adjacent concrete and asphalt ground finishes. For more information, refer to our sections on Platform Edges and Transit Facilities. At stairs, attention TWSIs should commence one tread depth back from the leading edge of the nosing at the top step and extend across the width of the stairs. The attention TWSI alerts a person with blindness that there is a set of stairs ahead and to seek the support of a handrail for safe navigation. The depth of the TWSIs used at the top of stairs should be 600 – 650 mm. For more information, refer to our section on stairs. At railway crossings, attention TWSIs should be located so that the edges of TWSIs are 1,800 – 4,600 mm from the centre line of the nearest rail. Attention TWSIs should be installed in addition to any mechanical barriers that are activated with the arrival of trains. 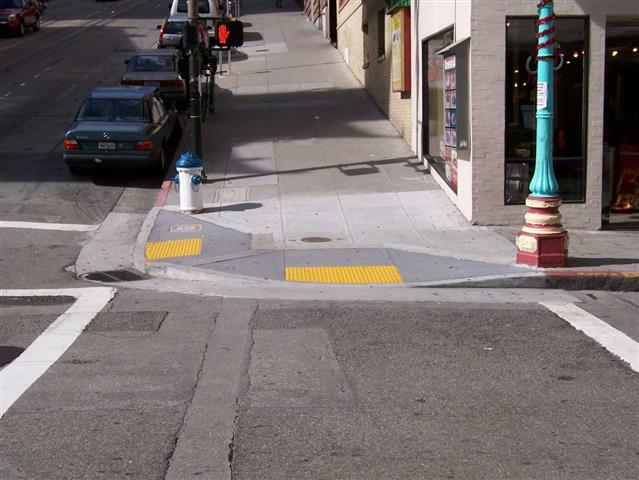 Attention TWSIs should be provided across the entire width of a curb ramp or depressed curb (exclusive of flares). They should be set back 150 – 200 mm from the curb’s edge and extend 600 – 650 mm in the direction of travel. For more information, refer to the section Curb Ramps and Depressed Curbs. Guidelines on TWSIs can be found in the section Escalators and Moving Walkways.